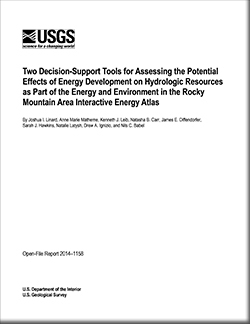 The U.S. Geological Survey project—Energy and Environment in the Rocky Mountain Area (EERMA)—has developed a set of virtual tools in the form of an online interactive energy atlas for Colorado and New Mexico to facilitate access to geospatial data related to energy resources, energy infrastructure, and natural resources that may be affected by energy development. The interactive energy atlas currently (2014) consists of three components: (1) a series of interactive maps; (2) downloadable geospatial datasets; and (3) decison-support tools, including two maps related to hydrologic resources discussed in this report. The hydrologic-resource maps can be used to examine the potential effects of energy development on hydrologic resources with respect to (1) groundwater vulnerability, by using the depth to water, recharge, aquifer media, soil media, topography, impact of the vadose zone, and hydraulic conductivity of the aquifer (DRASTIC) model, and (2) landscape erosion potential, by using the revised universal soil loss equation (RUSLE). The DRASTIC aquifer vulnerability index value for the two-State area ranges from 48 to 199. Higher values, indicating greater relative aquifer vulnerability, are centered in south-central Colorado, areas in southeastern New Mexico, and along riparian corridors in both States—all areas where the water table is relatively close to the land surface and the aquifer is more susceptible to surface influences. As calculated by the RUSLE model, potential mean annual erosion, as soil loss in units of tons per acre per year, ranges from 0 to 12,576 over the two-State area. The RUSLE model calculated low erosion potential over most of Colorado and New Mexico, with predictions of highest erosion potential largely confined to areas of mountains or escarpments. An example is presented of how a fully interactive RUSLE model could be further used as a decision-support tool to evaluate the potential hydrologic effects of energy development on a site-specific basis and to explore the effectiveness of various mitigation practices. Linard, J.I., Matherne, Anne Marie, Leib, K.J., Carr, N.B., Diffendorfer, J.E., Hawkins, S.J., Latysh, Natalie, Ignizio, D.A., and Babel, N.C., 2014, Two decision-support tools for assessing the potential effects of energy development on hydrologic resources as part of the Energy and Environment in the Rocky Mountain Area interactive energy atlas: U.S. Geological Survey Open-File Report 2014–1158, 16 p., https://dx.doi.org/10.3133/ofr20141158.